HomeVideosCannabis PolicyAn end to the UN as we know it‏? 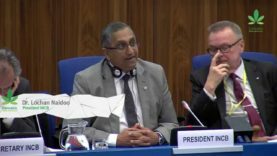 The United Nations’ drug conventions were recently discussed in Vienna by the Commission on Drugs and Crime. The results of this convention make it clear that, with regards to international laws regarding cannabis, the United Nations commission on drugs and crime is way behind despite a world-wide shift forwards. Even before the meeting, the International Narcotics Control Board, INCB, which oversees the implementation of the U.N. drug conventions, warned member states for being too progressive, like Uruguay and the United States, where already four states have regulated the recreational use of cannabis. UN Secretary General Mr. Ban Ki Moon has urged Member States to debate all options at UNGASS 2016.